What does the Anthropocene mean for subsistence farmers Lele or Rakoto? At first glance, nothing. It is, after all, just a fashionable term amongst the intelligentsia; the latest jargon to adorn project proposals to do more of the same. But on second thought, for these already marginal farmers, the Anthropocene might concretely mean less rains, stronger cyclones, new weeds: new stresses, challenges, and perhaps opportunities. These were my opening thoughts in a day-long workshop hosted at the University of Lausanne late last year on the Anthropocene. The purpose of the session was to confront different disciplinary views on the “Anthropocene”, a concept that, albeit officially geological, was promoted by an atmospheric chemist and has taken wings across the sciences far into the humanities. Three international guest keynote speakers represented ecology, geochemistry, and history (Erle Ellis, Jessica Tierney, and Jean-Baptiste Fressoz), while six additional speakers represented a variety of disciplines from my own university’s Faculty of Geosciences and Environment, from philosophy to geology. I was asked to comment on the anthropocene from the perspective of political ecology. All the videos are online; I’ve embedded my own below as well. My points can be summed up as follows. The “Anthropocene” is a concept, and political ecology has a long history of engaging with concepts (“degradation”, “nature”, and so on), where they come from, how they travel, and what they do. Political ecology’s epistemological conceit is to simultaneously take seriously the reality of the science behind the concept as well as to question how the knowledge claims are produced and politicised. As far as the “reality” of the Anthropocene, political ecology investigates how human transformations of the planet exacerbate inequalities, or how societies (the economy, institutions, power, discourses, practices) contribute to creating the transformations in the first place. 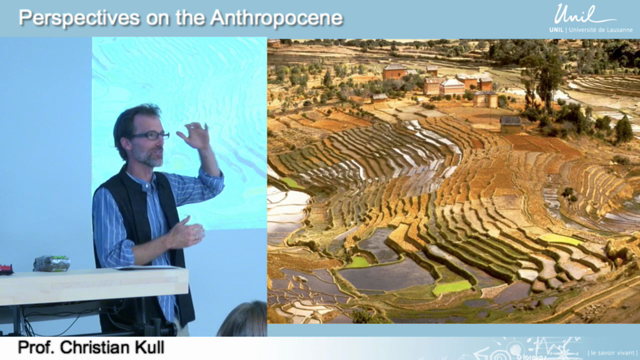 As far as the “concept” of the Anthropocene, political ecology is well placed to show how the Anthropocene is yet another metaphor in a long tradition of metaphors that guide our understanding of human-environment relationships (as Paul Robbins notes in his chapter in the Wiley-Blackwell Companion to Cultural Geography). The difference of this particular metaphor its that it works at a different scale than most, both temporal (geologic time) and spatial (the whole globe). And, like all concepts, it does political work. Ironically, it does so by being an anti-politics machine. It can be harnessed to serve opposing agendas (justifying complacency, or green agendas, or planetary engineering). It is apolitical, in not pointing out that some humans are more responsible than others, or in not challenging the system (hence Eric Swyngedou’s challenge that the Anthropocene is actually just another name – sanitised – for nature under capitalism). But it is certainly obvious too, that we humans have become a dominant force on this planet. If the above embedded video doesn’t work, try this (mp4 file) or this (vimeo). This entry was posted on Friday, January 22nd, 2016 at 8:48 pm and is filed under Interdisciplinarity, Political ecology, Sustainability. You can follow any responses to this entry through the RSS 2.0 feed. You can leave a response, or trackback from your own site. This is an interesting topic, although a bit confusing. The term Anthropocene implies a geologic era. Problem is that geologically, it cannot be defined yet since there are no geological deposits that clearly define it (except maybe for the deposit of radio-nuclides from the 1945 atomic explosions)! In a way it is a corruption of the geological nomenclature. The basic concept in my mind would be the “Anthropogenic Influences on Planet Earth”, although that would be a more narrow and quite different definition than the one you, Christian, elaborated on during your talk about the Anthropocene. You would have to go back to a time before the start of agriculture (12,000 years ago) as a reference point to make comparisons. I found it interesting that no one commented on the possibility that the epoch could be finite, in the sense that the exhaustion of natural resources (fossil fuels, arable land, i.e. food production, etc.) could lead to a collapse of the human race, as theorized in Donella H. Meadows, Dennis L. Meadows, Jørgen Randers, and William W. Behrens III’s book “Limits to Growth”, and in Harvard biologist E.O. Wilson’s many books on the topic. Everyone seems to assume that our technological wizardry will go on forever. That may well be what could happen, but no one has proven this to be a valid assumption. At this point it is mostly hope…but hope is not a strategy!